Monday I gave a modified and longer version of my presentation for ICoLIS to Librarians at the University of Malaya, including demonstrations of several sites like Facebook and FriendFeed. It was a wonderful group who asked some great questions. 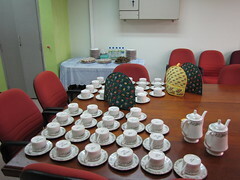 After there was a small tea reception with some delicious Malay food.